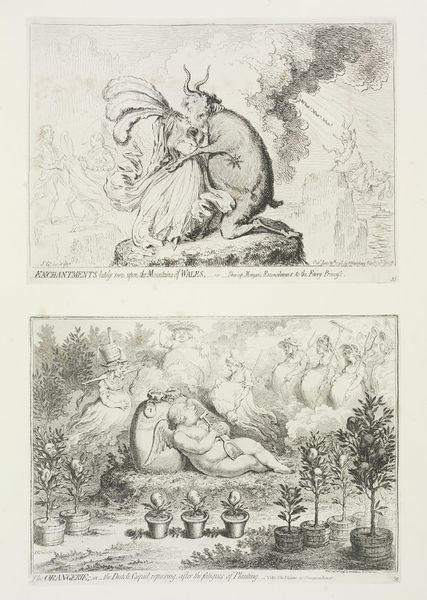 Two plates from an album containing 45 numbered prints on wove paper, the majority printed two per page, recto only. Numbered 35 and 36 respectively, number 35 depicts The Prince of Wales as an overweight goat, crouching on a tiny plateau, locked in a loving embrace with the Princess of Wales, who wears a coronet with three tall feathers. In the background to the left are three men dancing in a circle comprised of the Lord Chancellor, Alexander Wedderburn, 1st Baron Loughborough; the Duke of York; and George Cholmondeley, 4th Earl of Cholmondeley. In the background to the right are Lord and Lady Jersey, Lord Jersey also in the form of a goat. The couple are toppling backwards, hurled from the pinnacle by the words 'What? What? What?' blasting down from ominous grey clouds. Below them, Mont Orgueil Castle is visible across the sea in the distance. Lettered with titles, artist's initials, and the original publisher's name and address. 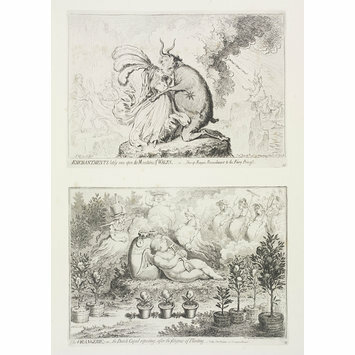 The second print on the same page is entitled 'The Orangerie' and depicts William V of Orange as an overweight and aging Cupid, stretched out asleep on the grass, clutching a small spade, and resting his head against two enormous bags of money. The bags are padlocked and inscribed '24,000,000 ducats'. In the foreground are orange trees, planted in pots. The oranges are in fact the heads of infants, bearing the same features as The Prince of Orange. Ghostly figures of heavily pregnant women float above him, carrying mops, pitchforks or milk pails, and bearing exhausted expressions. Lettered with titles, artist's initials, and the original publisher's name and address. Two plates from an album of 40 'suppressed' caricatures featuring sexual, scatalogical and politically outrageous subject matter by James Gillray (1756-1815). Issued mid-19th century.